It was an audacious request. To maintain her program’s global pre-eminence, Purdue University’s engineering dean, Leah H. Jamieson, persuaded the board of trustees to approve a $150 million strategic plan that would increase the faculty by 30 percent and add 1,500 students over five years. Eight months later, in January 2013, a new president took the helm, casting doubt on continued support for such a giant investment. In less than 18 months, Indiana’s former two-term Republican governor has emerged as an unexpectedly daring change agent at the land-grant university and quelled much of the skepticism and protest that greeted his selection. Daniels, the keynote speaker at ASEE’s annual conference in June, has become what Jamieson calls the school’s “chief champion” for engineering – throwing the full weight of his office and resources behind the expansion while pressing for even swifter improvements. He’s also launched a transformation of the College of Technology into a polytechnic institute focused on innovation and consumer-oriented research, called for a 25 to 30 percent increase in computer sciences, and set in motion changes that have reverberated throughout the entire university of nearly 39,000 students. Consistent with his eye for cutting costs as director of the Office of Management and Budget for President George W. Bush, Daniels slashed overall university spending, froze Purdue’s tuition for the first time in four decades, and reduced room-and-board charges and some fees. Those efforts have brought national attention to the 145-year-old institution known for its strong science, technology, engineering, and math-related (STEM) programs. 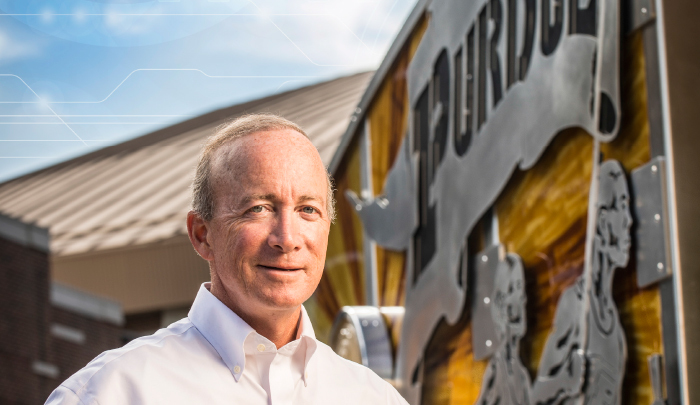 It’s also cast a spotlight on Purdue’s high-profile leader, one of an increasing number of university presidents who come from outside academia. In fact, the chance to boost that talent pool ultimately drew Daniels to Purdue, which produces more bachelor’s degrees in engineering and technology annually than any other U.S. institution. “You can be the patron saint of engineering,” encouraged his friend Jeffrey Immelt, the CEO of General Electric, with whom he discussed the offer. “I’m not very saintly,” Daniels responded, “but I do hope to really promote this most necessary profession.” Of the 10 priorities he outlined for the university earlier this year, half concern STEM-related studies and research, with engineering expansion heading the list. Daniels believes expanded engineering and technology programs should encourage more graduates to be innovators and job creators. “We’ve changed everything that we can find to change here to encourage that kind of thinking,” he explains, pointing to a recent reform he instituted that gives undergraduates full rights to any patentable invention they create. To liberal arts faculty concerned about the overemphasis on STEM, Daniels notes that last year he landed $3 million to endow two history chairs – the department’s largest gift ever – and says he’s committed to strengthening the liberal arts program wherever possible. Still, he adds, his administration has made a “strategic decision” to focus on engineering and related fields, what he sees as “the 21st-century version of the original land-grant assignment of agriculture and the mechanical arts.” “It’s a pretty good rule of life,” he says, “to do what you’re best at.” Daniels’s blend of fiscal conservatism and ideological moderation – plus the engaging style of a natural politician – made him attractive to Republican leaders, who urged him to consider a presidential run in 2012, an avenue he ultimately chose to bypass. His course change to academia was not met with similar enthusiasm. Many students, faculty, and campus staff protested his selection, citing cuts to education in his state budgets and concerns that politics was poor preparation for a college president. While Daniels managed to earn the trust of many early skeptics, his first year was not bump free. Dozens of professors railed against him last summer after the media uncovered emails he’d written as governor seeking to ban work by leftist historian Howard Zinn from being taught in Indiana public schools. In the fall, Daniels incited more campus anger after speaking to a conservative think tank in Minnesota, an appearance he later called a mistake. But it was in line with Daniels’s outgoing style. He’s tried to engage with fellow Boilermakers as much as possible – he’s a regular at the gym and in dining halls – and encourages colleagues to call him Mitch. Purdue provost Timothy D. Sands, who takes over as Virginia Tech’s president on June 1, says Daniels learned a lot in his first year and is “getting better at it.” An initial skeptic, Sands is “heartened by the fact that I don’t think he’s hit his stride yet.” Still, he and others say that the impact of someone willing to challenge orthodoxies – and do so much faster than academia’s usual leaden pace – already has been felt. Some faculty bristled at Daniels’s call for $40 million in universitywide spending cuts to offset the two-year tuition freeze he instituted and then extended to a third year. But the tuition break, along with the school’s shift to a common application, has resulted in a nearly 30 percent jump in applications. Donations are up about 10 percent, with a large shift to gifts for student assistance and scholarships. The visibility and high-powered network that Daniels brings as a former governor and White House official have had clear benefits. “He’s constantly making connections for us,” says Gary Bertoline, dean of the College of Technology, whom Daniels put in touch with business leaders, a billion-dollar education foundation, and the Indianapolis mayor’s office to develop a program for integrating STEM from kindergarten through college. Daniels also forged a partnership with the Gallup organization to measure Purdue’s impact on its graduates’ careers and lives. This interest in value lies at the heart of what Daniels considers a key challenge for all of higher education as tuition costs soar and inexpensive online options gain credibility. He begins many of his presentations with a grainy image of Joseph Schumpeter, the 20th-century economist whose theory of “creative destruction” describes the process by which the new displaces the old and makes industries from film cameras to record players obsolete. “What makes you think higher ed can’t be next?” he challenges his audiences. Susan Baer is a freelance journalist based in Washington, D.C.